When only the best will do! 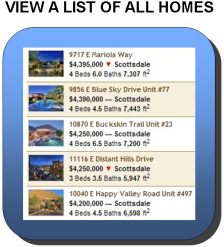 Our high-end real estate market in Scottsdale starts at $1,000,000 and escalates to well over $20,000,000. 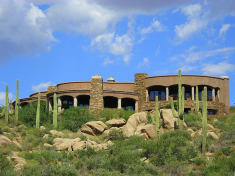 From this page you can easily browse all available Scottsdale luxury homes for sale from the Arizona MLS. Our listings are updated daily, so you never have to wonder if you have the most current and up-to-date information available. 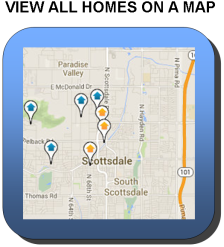 To get started, simply click on your choice of buttons below to view a list of all homes, or view properties on a map. The most expensive estate to ever sell in Scottsdale, AZ according to MLS data was 9422 East Happy Valley Road in 2006. After originally being listed at $24,950,000, the seller reduced the price to $19,000,000 two years later, and finally "settled" for $10,000,000. Annual property taxes on the mansion? $14,648.00. Relatively speaking, the taxes are surprisingly reasonable. Surprisingly, the highest priced high-end home sale in the history of the Arizona Regional Multiple Listing Service was in Cave Creek. 6902 E Grapevine sold in 2002 for a whopping $12,500,000. However, the 10,000 square foot home also included 225+ acres of land. The luxury home market in Scottsdale accounts for approximately 30% of all Scottsdale homes for sale in the Arizona MLS. Luxury being defined as single family homes priced over $1,000,000. Although every deal is different, and percentages are fluid, on average home buyers in Scottsdale ultimately end up paying roughly 96% of list price for their home. A brief and incomplete list of prominent Scottsdale custom home builders include Kitchel, Gietz, Cullom, Argue, Gurley, Calvin Wyant, Byrne Construction and Salcito Custom Homes.